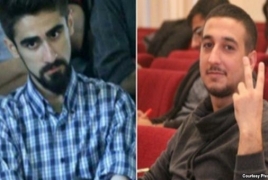 PanARMENIAN.Net - After releasing 24 political and religious prisoners, Azerbaijani authorities seem eager to fill the empty cells with more freedom defenders, Freedom House said following Azerbaijani authorities’ May 12 arrest of two members of the N!DA youth movement. “None of Azerbaijan’s repressive laws have been repealed. Democratic countries should demand that Azerbaijan respect fundamental freedoms and permit civil society to operate freely,” said Robert Herman, vice-president for emergency assistance programs and multilateral advocacy. Bayram Mamedov and Giyaseddin Ibragim, two members of the Azerbaijani youth movement N!DA, were detained on May 10 and charged with possession of illegal drugs. A court in Baku ordered them detained for four months. If convicted, the activists face up to 12 years in prison. Civil society activists believe the real cause for arrest was graffiti painted by unknown persons on the monument for Heydar Aliyev, the former president and father of the current president. The graffiti, saying “Happy Slaves’ Day,” appeared on the monument on May 10, Heydar Aliyev’s birthday, marked by the government as a holiday. Over the past two months, the government released from custody two dozen human rights activists and other political and religious prisoners, and let human rights defenders Leyla and Arif Yunus leave the country. At the same time the Azerbaijani authorities began a smear campaign against the opposition Popular Front Party, opened a criminal case against 15 journalists of the independent media Meydan TV, and threatened other activists, Freedom House said. Azerbaijan is rated Not Free in Freedom in the World 2016, Not Free in Freedom of the Press 2016, Partly Free in Freedom on the Net 2015, and receives a democracy score of 6.86 on a scale of 1 to 7, with 7 as the worst possible score, in Nations in Transit 2016.